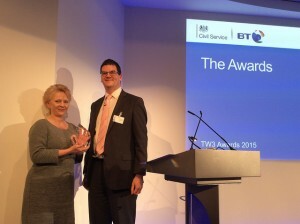 The first TW3 (The Way We Work) Awards to celebrate achievements in smarter working have been handed out. Nominations from 12 different government departments were submitted to a panel of some of the country’s foremost experts, chaired by Olly Robbins, Director-General of the Civil Service. They had the unenviable task of reducing 46 entries to just 3 per category (for Culture and People the competition was so close that they had to split the category into 2 winners: single- and multi-site). 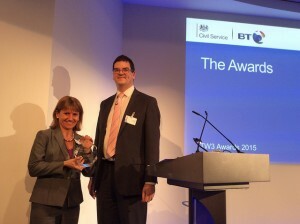 2014 was the year smarter working and TW3 were really embedded across the Civil Service. TW3 has grown because its common sense. It’s about people and helping them work effectively. Treat people as the capable adults they are... Choice and trust empowers people to make great decisions. The energy and buzz in the room were palpable and the word on everyone’s lips was ‘people’. All these projects are about supporting people to work better and smarter - better for them and better for the public service work they do. 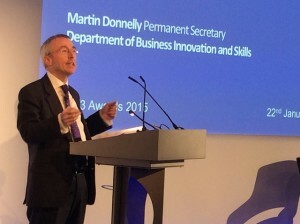 The awards’ 4 categories reflect the key areas being developed for a national Smart Working Charter. Dstl’s smart working project provides a modern way of working for the whole organisation. 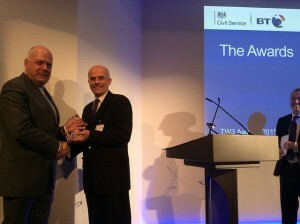 Dstl was judged the winner in the face of stiff competition because of the way individual Executive Team members have championed smart working, leading by example to find ways to work smarter and more effectively, achieving the benefits of mobility and collaboration physically and online, even in a highly secure environment. The past year has seen a technical revolution for the Ministry of Justice, as the roll-out of modern mobile technology meets the new demands for increased mobility and flexible working as part of the MoJ’s TW3 programme. 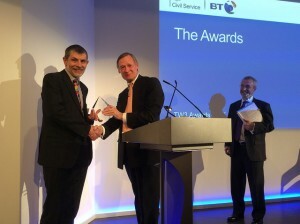 In a very strong field, MoJ were judged to have shown the most integrated, department-wide technology improvement programme. It was focused specifically on supporting smarter working by responding to user needs and evaluating the impact on user experience and perceived productivity. This is a great example of showing how technology can be used to set both people and information free within an organisation. By providing ‘ubiquitous’ access across a range of devices and services, collaboration is allowed to flourish, which enables the organisation to become more responsive, agile and effective. In DH, the Estates team and the IT team have come together in a holistic approach to providing ‘workplace’. The judges felt that DH demonstrated the best example of a property portfolio optimisation that enabled smart working through technology and choice of settings, and delivered real benefits in terms of cost and sustainability. Launched in 2012, BIS’s Ways of Working is a staff-led continuous improvement programme focused on developing and implementing user solutions that help people work more effectively and efficiently. The judges were impressed by the way BIS has engaged its people through this programme. Workspaces and IT are harnessed to support wider cultural change in the department, understanding that engaging and motivating people is the key to providing better service. DCLG’s London HQ co-location with the Home Office, and the re-let of its IT contract, resulted not only in savings for the department but was the catalyst for wider cultural change and benefits. The judges were impressed by the way this programme involved staff at all levels, and the evidence of a more open and transparent culture that has emerged alongside the more open and transparent working environment. 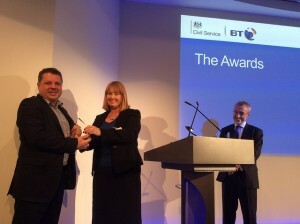 This was judged to be the best example of a change management programme focused on a workplace transformation. These projects, including the runners up, those that were highly commended, and more, will feature in this blog over the weeks to come. As Dave Coplin said during an excellent panel discussion, the next challenge is to ensure that all those not in the room are supported on their smart-working journeys. Now, we need to build on the progress that’s been made. Roll on the TW3 Awards 2016. I have stumbled upon this today and I now understand the context of HMRC's "Building our Future" project of change far more. I am certainly in favour of examining ways to make the civil service more efficient, effective and indeed cheaper to run, but I clearly have a lot to learn about the timescales of government as I notice the "Working Without Walls" report was published in 2004; the "Working Beyond Walls" was published in 2008 (which I guess by implication meant we couldn't remove the walls so we sought to clamour (sic) over them). The "Smarter Working" leaflet was published in 2015 so perhaps that we had either forgotten about the walls completely or we could no longer work without them or beyond and still remain inside them. So we move to TW3 - I am not sure if this is tacit approval to relocating to Hounslow or if this is a giant spoof to mark the return of "That Was the Week that Was." In any case, like with much of government - you wait an age (10years) before you see anything happenning, but when it does it usually turns out to be pretty well structured and thought out. Good Luck from me in HMRC. As I said before, I'm a Listcaller in a Magistrates' Court. How does this affect me?? Would be good to have more info on the specific actions undertaken by the winners and runners-up. Thanks James. Completely agree; so we are working with all the finalists to develop case studies to provide detail and insight in to their programmes and projects. We will be presenting these here as soon as they are ready, alongside other contributions and perspectives on the subject of Smart Working. I also hope there will be a number of opportunities to hear more from the projects and people involved, in person, at events over the coming months.